Your shoulder is the most mobile of your joints, but it can also be complex to treat. It connects to so many parts of the body that pain in the shoulder can often be linked to issues with your neck, upper back posture and stiffness in your middle back. When treating a shoulder complaint, your physio needs to consider all the surrounding structure and muscles. It is a naturally very unstable joint so having strong surrounding muscles will add a lot of stability to the shoulder. 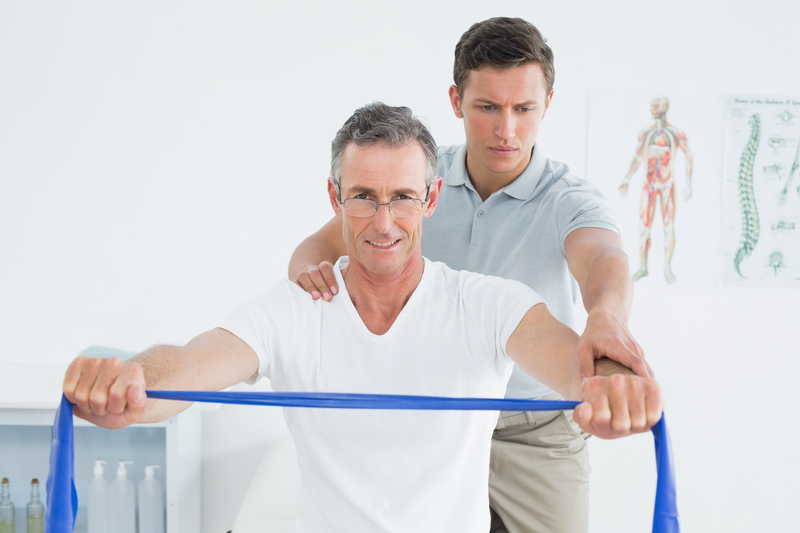 Unfortunately, too many people suffering from a shoulder pain will leave their physio, promising to do all the exercises they’ve been given, but as soon as the pain wears off a bit, or they get bored, enthusiasm wanes and they stop doing their exercises. People often forget to continue their exercise programme when the pain improves. I always follow up on my clients at Petersfield Physio to make sure they complete the course I give them, or else they could be storing up problems for the future. There are some common shoulder injuries that we see in our clinics, each requiring different treatment. Frozen Shoulder (or Adhesive Capsulitis) This can be very painful and as the condition progresses movement becomes very restricted. Rotator Cuff Disorder can cause pain on movement above shoulder level or behind the back and can be caused by repetitive overhead activities. Instability can also occur with repeated overhead movement and can lead to partial dislocation. Dislocation can occur after a fall or direct impact. Many of the treatments we advise for shoulder injuries involve exercise and an important part of your recovery will be the commitment you make to the exercise plans you are asked to do at home. A speedy recovery will be significantly helped by continuing to build your strength through exercising between physio visits. Exercises will help you to regain full range of movement and function. Taking the time to exercise will help relieve pain quicker. Continuing your exercises between treatment can help avoid further injury. Doing exercises between visits can reduce the number of trips you need. This is really important if you only have limited time available to get to your physiotherapist. When recovering from any type of shoulder injury it’s important to persist with your recovery programme. If you were prescribed medication, you would take it as instructed and the same idea applies to your physiotherapy exercises. At Petersfield Physio we are here to support our clients every step of the way in their recovery, even when they find it hard to commit to their exercises. If you are experiencing ongoing shoulder pain, and live in the Hampshire or Surrey areas, contact the Petersfield Physiotherapy and Sports Injury Clinic or ring 01730 267645. We are here to advise, guide and support you back to a pain free, active lifestyle. After all, it’s a joint process.